The collection of buildings that makes up Notre-Dame de Bon Secours is to be found at 68 Rue des Plantes, in southern Paris’ 14th arrondissement. Bordered to the south and the east respectively by Rue Giordano and Rue des Plantes, the site has an area of almost three hectares. The heritage of this site is a long history of building that began in 1875. The first wings of the hospital and the chapel were soon joined by new buildings in the same architectural style, following an orthogonal plan along two axes, alternating buildings and garden areas. In 1985, demolitions and new constructions broke the architectural coherence and upset the reading and use of the site. 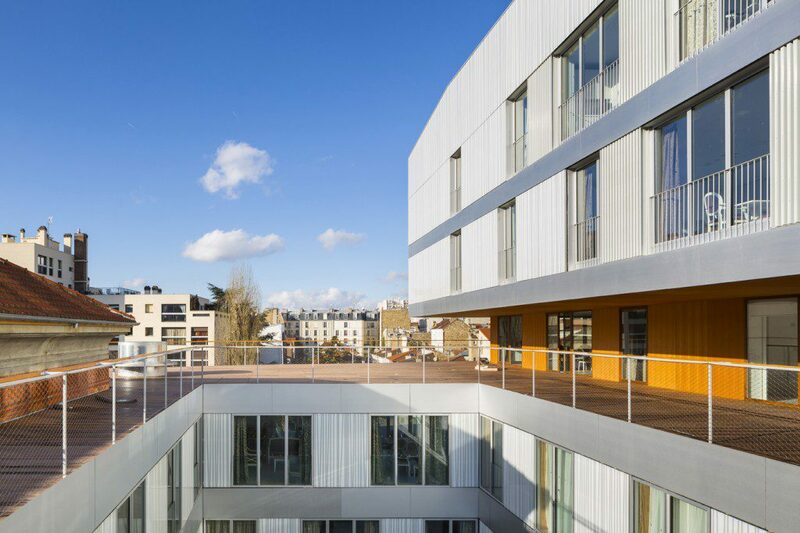 The recent transfer of the maternity unit to another hospital (Saint Joseph) provided the opportunity for the organisation to convert the Rue des Plantes site into a leading community healthcare centre, as well as to re-establish a harmonious and functional architectural ensemble. 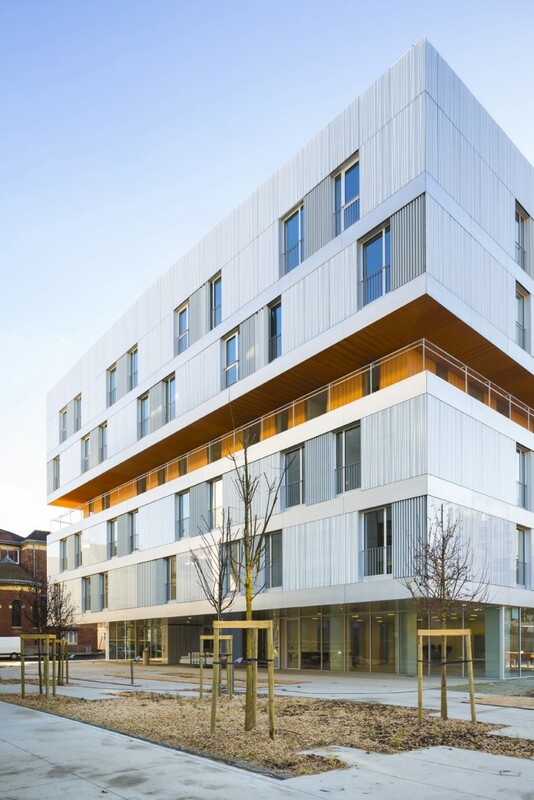 The transformation of the Notre-Dame de Bon Secours site reflects the evolution of healthcare; from the late 19th-century linear building, to the broad floors of modern medical centres. Following the demolition of the most problematic buildings on the site, including the maternity wing, a large building operation was planned in two phases so as to manage re-housing and building on an occupied site. Phase one, now being completed, comprised the construction of a new building to house a 98-bed residential care-home for the elderly and a 64-place crèche. It is built on the site of the demolished maternity wing, in the south-west corner of the plot, on the Rue Giordano Bruno side. 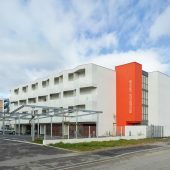 The project also involves the renovation of the street-front building of the old nursing school, known as the ‘chateau’, to house a new children’s healthcare centre. The overall programme covers a total surface area of 14,000 sq m (GIA). 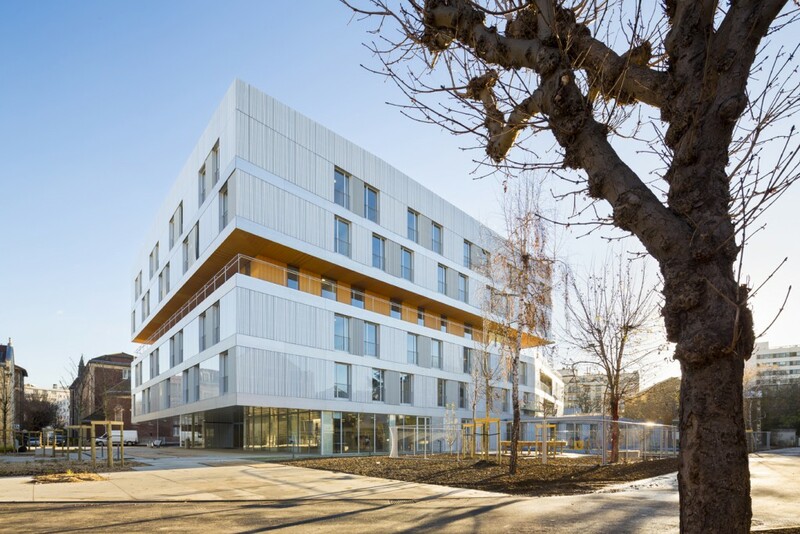 Phase two, due for completion in 2017, will see the construction of a nursing home for disabled patients at the northern corner of the site by the Rue des Plantes. The project, which involved a comprehensive rethink of the whole site, began by considering its organisation. First, the access routes and thoroughfares across the site were revised. The main entrance at 68 Rue des Plantes has been maintained, but a secondary entrance on Rue Giordano Bruno has been added. Between these two access points, pedestrian and vehicular circulation has been reorganised, separated by category, and made secure. The two major axes through the site have been reinforced by careful landscaping. The principal east–west axis linking the main entrance to the ‘big garden’ has been redefined by the insertion of the new building, set back, and by continuous paving that affirms the ensemble. The ‘big garden’ now comprises a park, allotments and a garden for the creche. The new axes are accessible for those with reduced mobility and have been resurfaced. This redevelopment of the site provides residents with the opportunity to sit in the sun, get a breath of fresh air, and enjoy the greenery. The environment promotes the use of these spaces by the residents. They have been carefully orientated, with open views and plenty of light. 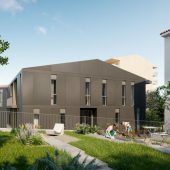 AZC have designed a six-storey building that adjoins the ‘chateau’. 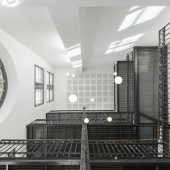 Its wide floors are arranged around two internal planted courtyards, its domestic architecture deliberately distancing it from the functional image of a hospital. The ground floor is reserved for entrance areas, public spaces and the creche. The residential units are found on the first, second, fourth and fifth floors. They are distributed around the perimeter of the building. 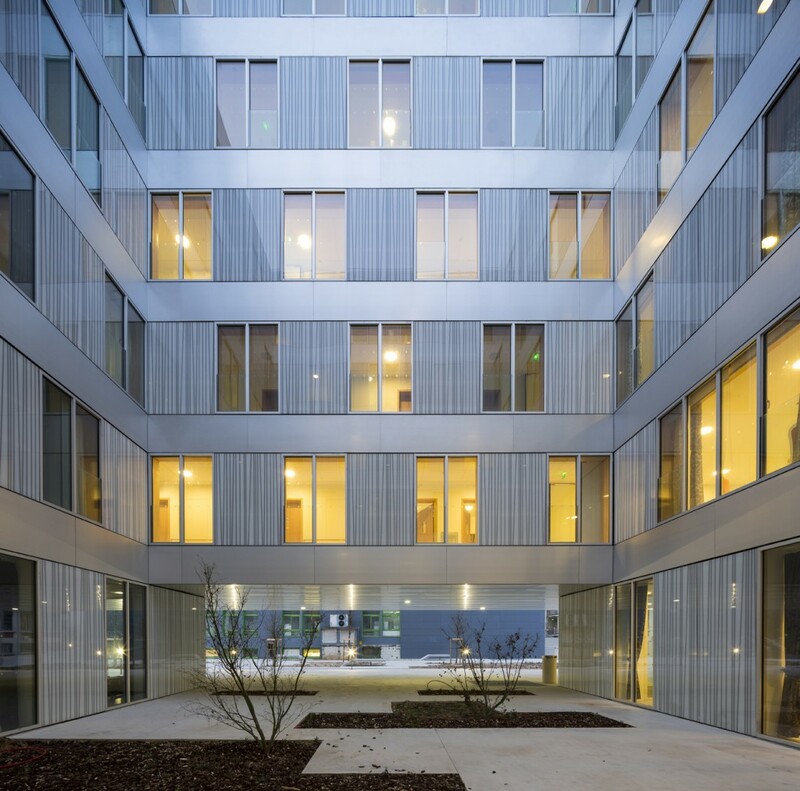 Residents’ circulation is arranged in a figure-of-eight around the courtyards, at the heart of the buildings, with gentle natural lighting for comfort and a feeling of security. 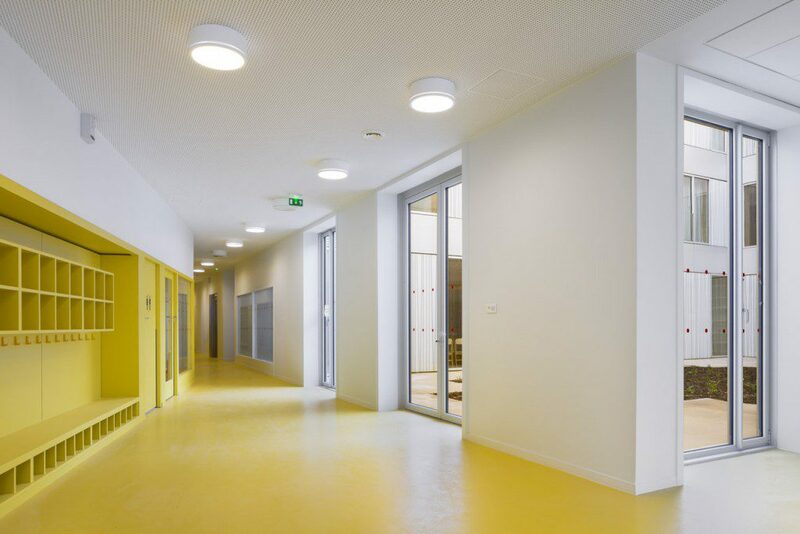 Whereas communal areas in this type of building are often found on the ground floor, AZC has put them in the middle of the building, on the third floor. Indeed the third floor is a horizontal break in the shape of the project. Above it, floors four and five have a smaller footprint than the three lower floors, enabling the creation of broad terraces. 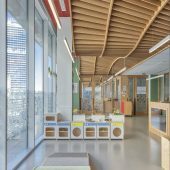 It also creates a break in the functions of the building, with the floor reserved for group activities, which are held in the large, glazed spaces that give onto the internal gardens. Covered terraces, like large intermediary loggias, are also found on the first two floors. The ground floor is freed up for maximum transparency towards the creche garden. 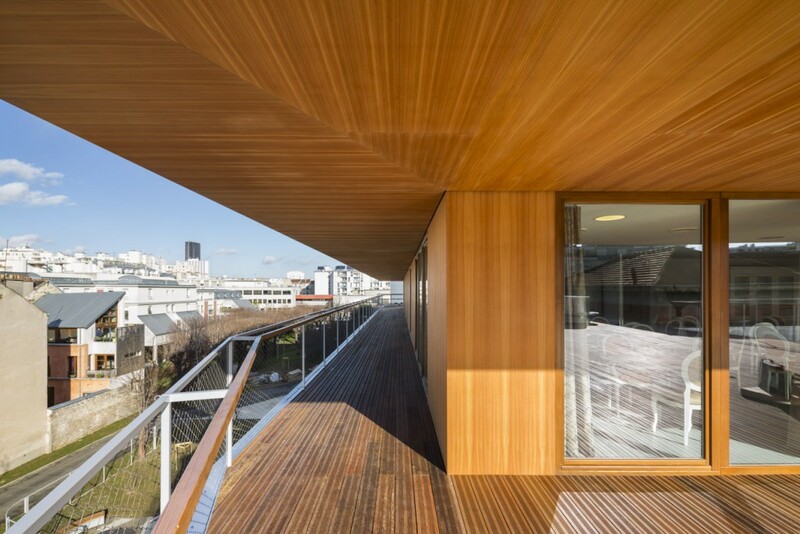 This allows light into the terraces and patios, opening broad views of the city and the landscaped areas. Residential accommodation is broken up into units of 12 to 14 beds. 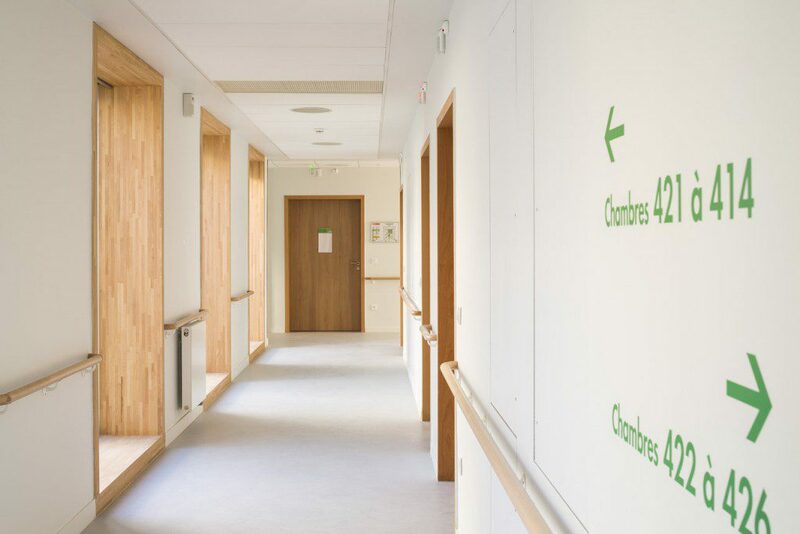 This scale enables not only efficient organisation and passage, but also improves working conditions for the carers and the daily life of the residents. Each unit comprises an open kitchen, a dining room and a sitting-room giving onto a covered terrace.